The wall sconces are beautiful. Where can they be purchased? The wall sconces are available thru our company. For pricing and availability, please contact us via email at Kennethdavisinc@gmail.com. Thank you and we look forward to hearing from you. small chest - Where can Ipurchase two small chests similar to the one in this photo? 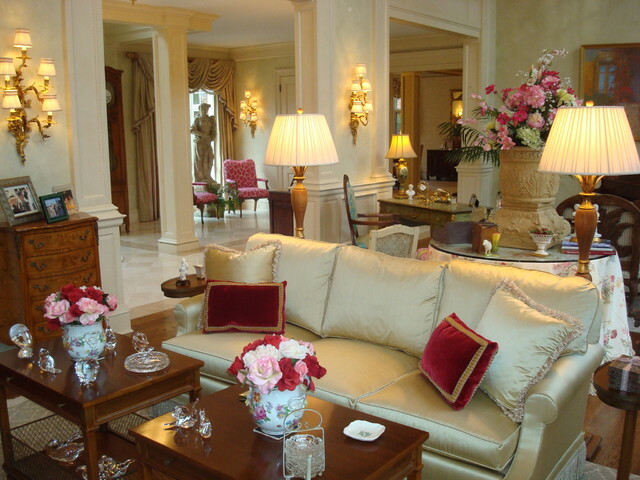 French Chateau In the formal living room, we chose to create a neutral back drop, but introduced pops of color. The silk sofa is done in gold with a pop of magneta as pillows. The colors are drawn from the clients favorite painting located in this room at the far wall. The five tier sconces were a find and adds addtional drama to the two story height of the room.